Cooktops are an important kitchen appliance that is used from simple tasks, such as making tea, to complex endeavors such as grilling a piece of steak. Most households’ cooktops are a range that connects to an oven below. These are a great option if you have space and use the oven frequently. If you lack the space however or do not intend to use the oven, a built-in cooktop is your best option. Cooktops provide flexible design options in providing both aesthetics and convenience in the kitchen (Source). Downdraft cooktops will aid in reducing the heat in the kitchen and allow more storage space at the same time. The extra space can be used to store other crockery and cutlery. Whether you are looking for a face uplift or just want the convenience of a downdraft cooktop, finding the best one that bodes with your kitchen can be a bit of a task. Read our review further to learn more. The Frigidaire RC36DG60PS is a 36-inch gas cooktop that seamlessly eradicates smoke and odours while cooking. The cooktop has four burners that enable you to prepare more than one meal at a time. If you happen to be an impatient cook, you will appreciate the PowerPlus Boil feature. This comes with a 17,000 BTU which makes is quick and easy to boil anything super-fast. In addition to the above cookery essentials, the cooktop is easy to regulate thanks to the Pro-Select controls. For professional chefs, the continuous grates are always a plus because they enable you to move pans and pots without necessarily having to lift them. With a dishwasher-safe filter, this cooktop is also easy to clean. DCS is a renowned name in downdraft cooktops, and the DCS CDV304N is no exception. The cooktop comes with sealed dual burners, which is a trademark of the company. These burners are able to heat your meal quickly using up to 15,000 BTU heating power. On the lower spectrum, the burners are also capable of simmering sauces at a constant 3,000 BTU. The cooktop comes with a great stainless steel finish that ensures you can easily clean the cooking surface. The cooktop has a good portable size that makes it ideal for any sized kitchen surface. In addition, the deep platform full coverage style makes it easy to move kitchenware around with ease. To enhance control the cooktop has metals dials that are ergonomically placed and are easy to read. 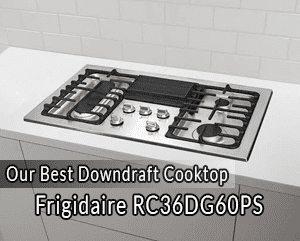 The downdraft is an addition that you purchase separately. The Bosch NGM5655UC500 is equipped with stainless steel grates and features a very simple design. The grates are easily removable making cleaning an easy task on this one. The five burners are well spaced out to enable the cooker to use all of them simultaneously if need be. The industrial class metal knobs set this cooktop apart from the competition. This makes the cooker durable and almost not needing a replacement. Bosch is also geared to making this cooktop the only one you will ever need by providing a comprehensive warranty. The warranty covers coverage from defects and will offer replacements and repairs within the stipulated time. 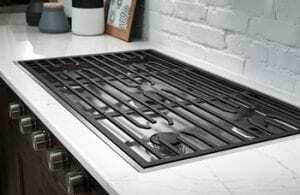 This high-grade GE Profile Downdraft gas cooktop is unique as it comes with an all-purpose burner of 11,500 BTU. The high temperature allows you to quickly cook meals and boil water. To accompany the high-temperature burner, the cooktop has convenient edge-to-edge grates that are heavy enough to support heavy cookery. The knob controls are also durable and come with LED lighting to let you know when they are switched on. These also add to the aesthetics of the cooktop. The 30- inch GE Profile has a sealed cooktop burner that assists in containing any spills that may come about when cooking. Most people don’t enjoy cleaning cooktops, and GE’s inclusion of dishwasher-safe grates is set to make your cleansing job stress-free. LED lights are handy when you aren’t sure if the cooktop is in use. 11,500 BTU is comparatively low. 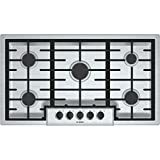 The Kitchen Aid KCGD500GSS is a professional level cooktop with 4 burners and 17,000 BTU. The cooktop is capable of attaining high temperatures and going low enough for simmering cooking jobs. The burners are electric and can light up with an electric spark. Professionals love and adore the re-ignition feature that relights burners if the flames run out. The burners can be transformed into a gas cooktop as it allows LP gas. Your cooking habits, budget, and personal preferences all play a major role in determining what type of cooktop suits you. Without any further ado, here are some of the major factors we recommend you consider when you are out shopping for one. Gas was once the darling for many professional chefs worldwide, but this has quickly changed since the advent of smooth top surfaces and induction cooktops. This is not to say that gas cooktops are inadequate. They still provide the quickest reaction times and also provide an option to regulate the heat level via a visible flame. Gas burners are particularly excellent at executing high-heat tasks like stir-frying but fall short when it comes to low temperatures activities like simmering. If a gas burner is at the top of your priority list, make sure to get one that can output 9,000 BTUs per burner. Electric cooktops, on the other hand, have a bad reputation for slow response times but hold their own when it comes to producing consistent temperatures for simmers and delicate cooking activities. Albeit a bit expensive, smooth-top electric cookers are the best. Avoid electrical cookers with coil burners because they can be tiring to clean. The latest electrical cookers, however, make use of induction technology making them more responsive to temperature control and the safety of a cooler surface to touch. Most cooktops in the market range between 30 and 36 inches and have four to five burners. For professional chefs looking to make complicated meals at home, a 48-inch burner would do, but that would cost a few dollars extra. It’s important to understand that the cooktop will take up space on the counter and you will have to calculate the space that will remain before getting a sizable cooktop. If you are replacing your old cooktop, take the measurements when searching for a new one to make the installation as easy as possible. It’s important to consider the venting of your cooktop especially if your cooktop is installed without an overhead exhaust. Ventilation is important as it helps release odours, fumes generated while cooking. Vary hoods, or over-the-range microwaves can be of use if the cooktop is beneath a cabinet otherwise a downdraft cooktop is your best bet. Downdraft exhaust systems are not as effective as overhead systems but are very useful in pulling grease, smoke and steam down to the outside. When it comes to ease of cleaning, smooth top and induction cooktops win this category hands down. Unlike coil burners that allow spills to go beneath the elements, flat surface cooktops are fairly easy to clean thanks to the ceramic top that you can wipe in seconds. Whether you pick a gas or coil cooktop, they both have pieces that you have to take apart while cleaning which can be tedious. Most gas grates are dishwasher safe but will vary from one model to another. If cleaning is a top priority for you, induction cooktops are the best option. They are easy to clean without the risk of burns otherwise the other cooktops will also come with cleaning instructions nonetheless. 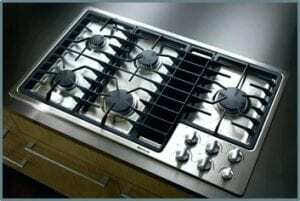 Gas cooktops use open flames and are therefore the most unsafe options available. This means that your dishtowel can easily catch fire when you are not paying attention. Electrical cooktops are next in line in terms of safety as they change colours to show when they are hot or not. The safest, however, are induction cooktops. These have the ability to warm food without ever getting hot to the touch. This means that both gas and electric cooktops can be dangerous if not careful with their use. If you happen to have kids around the house then induction cooktops are obviously your safest bet otherwise the safer of the other two will depend on your familiarity with them. Gas powered cooktops will mostly feature knobs for control, but electrical models can vary from one to another. High-end electric cooktops tend to do away with knobs in lieu of digital controls. Touch controls are intuitive because they offer one-touch controls and are also easy to clean than their counterparts. Both knob and digital controls work perfectly fine, and the better one is a matter of personal preference. If you would like something a bit user-friendly, however, a digital controls model will serve you best. There are a variety of factors that can drive up the price when it comes to cooktops. For starters, you will find that size matters; larger cooktops will generally sell at a higher price. Electric cooktops with a number of features and will definitely cost more than gas cooktops. The most expensive ones, however, are induction cooktops. With cooktops, you have to be wary of the initial capital as well as the long-term costs. A good example is an Induction cooktop. These bear the biggest burden when buying the first time but will save you the most in your monthly electricity bill. Electric cooktops, on the other hand, are fairly costly and will also bore a hole in your pocket in your electricity bill. 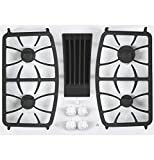 Gas cooktops; though inexpensive also have replaceable parts such as the grate and the drip bowl and will cost you too. None is everlasting, and it’s prudent if you chose a durable model if you would like to save a dollar or two. Despite being of the inexpensive option, electric cooktop actually perform better in longevity than smooth tops. As always the brand and quality of the cooktops are always a telling factor if you intend to use your cooktop for many years. To land a durable cooktop make sure figure out the reputation of a product. While these play a major role, your maintenance also enhances the durability of a cooktop. Regular cleaning will make your cooktop last longer. Warming Zones: some electric cooktops come with a nifty warming zone that keeps your cooked food warm. This feature maintains your food at ready to serve warm but never overcooked. Power Boil Burners: If you’ve ever felt impatient while boiling water or soup then this is geared for you. Power boil burners help in getting your food hotter faster. Cooking Modules: Cooktops from leading brand manufacturers come with modules that expand the type of cooking you can do. Such modules include the grill, deep fryer, or a steamer. Control Lockout: if you are paranoid about safety say due to kids in the house then a control lockout can be something of very high worth to you. A control lockout helps limit the person who can use your cooktop via a control lock mechanism. To have the best kitchen experience with a cooktop with downdraft you inadvertently have to go for the best. The most expensive ones are not necessarily the best, go for an affordable model that is well designed with good power levels and a host of features that will ensure you cook amazing meals. 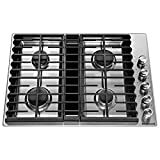 The five best cooktops above with downdrafts assortment took into consideration their cost, controls, burner power, size, and the number of burners. Regardless of your preferences and or your kitchen space, we are sure you will find one that will meet your needs adequately. Please let us know which it is. Many potential customers would like to learn from your experiences.